The Eyegaze Edge is an eye-operated communication and control system that empowers people with disabilities to communicate and interact with the world. By looking at control keys or cells displayed on a screen, a user can generate speech either by typing a message or selecting pre-programmed phrases. Eyegaze Edge Systems are being used to write books, attend school and enhance the quality of life of people with disabilities in any situation. Highly accurate and predicts a user’s gaze point to within 1/4 inch or less. Programs & hardware are designed to reduce or eliminate visual fatigue associated with eye-controlled systems. Fast input, activation time is user-determined and can respond in as little as 1/10 of a second. Comfortable so that a user can operate from any position, including side-lying or with the head tilted, without tilting the screen. Works with most eye variations including extremely large or small pupils, nystagmus, or irregularly shaped pupils. Handles ptosis (drooping) of the eyelid – entire pupil does not need to be visible. 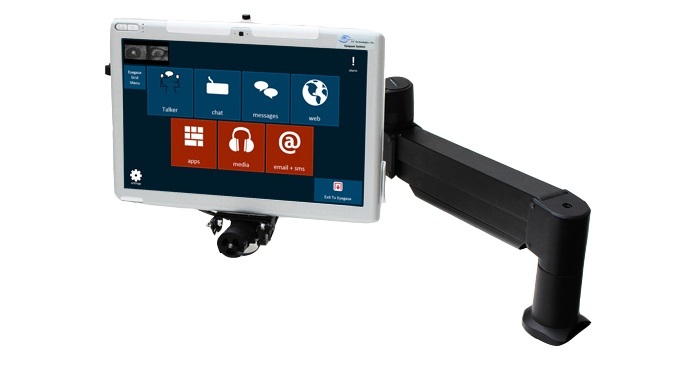 The Eyegaze Edge can be positioned high or low with a focus range of 16-30". Provides off angle tracking so the user does not need to be parallel to the screen. Tracks through lenses and works with eyeglasses and most contacts.